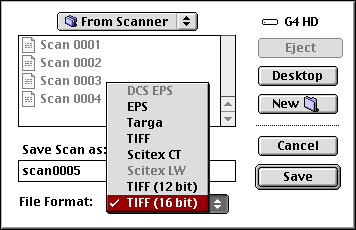 IPTC metadata can be input into the file information on the raw scan, so it carries over to any subsequent files, to assist in electronic archiving. All images are spotted to remove small imperfections on the film to restore the true image. Extensive damage (pervasive scratches/particles, stains, etc. which require more than a basic cleanup) can also be repaired for an additional $50 per half hour of work. 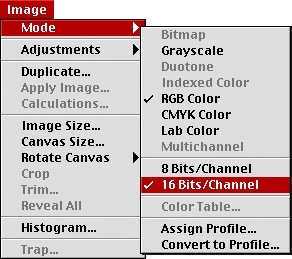 Photoshop CS to CS5 support 16-bit layers, allowing an easy drag and drop of the supplied adjustment layers onto a copy of the master archive scan. 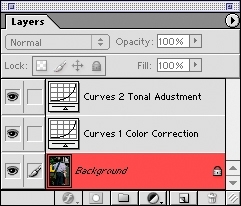 In Photoshop 7 or previous, the curves/levels can be saved onto the desktop, then and loaded individually. 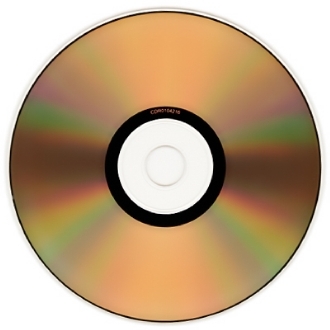 Written as lossless TIFF files onto high-quality optical media or portable hard drive or cloud download, the full-resolution raw scan is accompanied by a smaller, more manageable version. 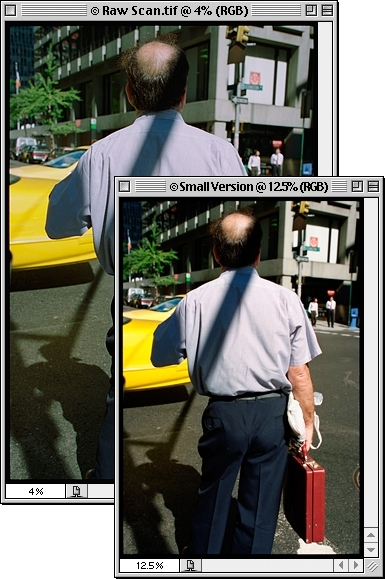 This downsampled proxy file includes a basic color correction in a non-destructive, separate Photoshop Adjustment Layer. This and additional tonal edit layers can be fine tuned in the small version - then applied to a copy of the original archival raw scan. The original is left untouched. Sharpening is not applied to the scan. Although any optical or digitization process imparts a small amount of inter-generational blurring, the degree of sharpening is dependent on final output size, output device, subject matter, film grain structure and personal taste. The Howtek HiResolve 8000 uses highly-sensitive photomultiplier tubes (PMTs) which are receptive to the smallest tonal changes and details in film. If it's on the film, it can be captured by the scanner - the finest gradations in the densest to the clearest areas of the transparency or negative. Optical apertures as small as 3.2 µm can resolve up to 8000 samples per inch. Since the photomultiplier tube drum scanner captures the entire range of information on the film - from the specular highlights to the deepest shadows, the D-Max to the D-Min - the scanned image may appear low contrast. Using 16 bits per channel (48 bit RGB) allows extensive tonal manipulation for correction. Additionally, using 8000 samples per inch (uninterpolated optical resolution) shows detail up to the true grain structure itself. The TIFF file created is a virtual original, with all of the film’s analog information available for precise digital adjustment. 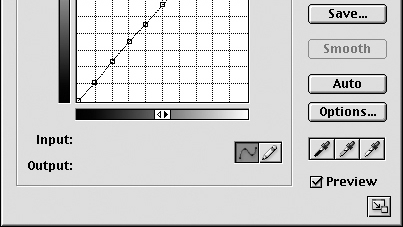 For negatives, histograms are adjusted at the input/scanning stage to include the complete tonal range of the original and to avoid clipping. For Ektachrome, Fujichrome and Kodachrome film, the scanner uses a color profile based on a Hutchcolor or Kodak Q-60 target which accurately and automatically matches the colors in the original. The highly-detailed tonal description of a 16 bpc (48 bit RGB) file allows for both heavy manipulation before posterization occurs and a more accurate conversion into other color spaces or bit depths. This file is intended for use as a high-information archive and working file with a conversion to 8 bpc necessary for output. 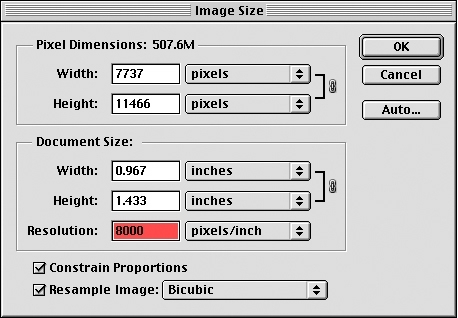 To take full advantage of the high bit-depth, perform as many adjustments as possible to the original file before conversion to another color space or bit-depth (i.e. CMYK or 8 bpc). Reducing light diffraction, Kami Scanner Mounting Fluid prevents Newton Rings between the film, drum and mylar surfaces. In addition, dust and some small scratches are also minimized. The appearance of harsh film grain is also slightly reduced. The highly-volatile petroleum-based liquid evaporates quickly and cleanly and is archival-safe. At certain scanning magnifications, negative films (especially color) exhibit a phenomenon similar in appearance to increased grain. To correct this, negatives need a very high sampling rate to have a natural, non-exaggerated granularity. This is due to the aliasing between the randomized organic film grain and the structured grid of pixels. This effect, comparable to a Moiré pattern, is eliminated by using 8000 spi in addition to optical adjustments in the scanner itself. For negative film, a sampling rate of 8000 per inch is recommended. This resolution will accurately describe the grains/dye clouds, thus avoiding aliasing. A negative scan at 8000 spi downsamped to 2000 or 4000 pixels per inch will have a normal amount of grain compared to the amplified “graininess” of a direct scan at those respective resolutions. 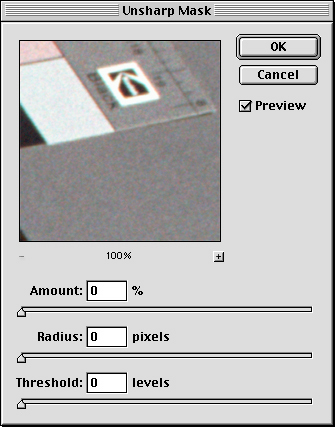 The grain aliasing effect for negative film is usually most apparent at 4000spi. The latest negative emulsions are optimized for scanning, reducing grain aliasing. All chromes exhibit a negligible amount of this adverse effect.